Preheat oven to 375°F. Spray a 9-by-13-inch baking pan with non-stick spray coating. 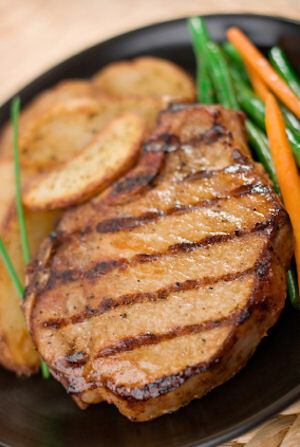 Trim off the fat from the pork chops. Whisk the egg white and evaporated skim milk in a large bowl. Place pork chops in the egg/milk mixture and allow to soak for five minutes, turning chops halfway. In a separate large bowl, mix together the cornflake crumbs, bread crumbs, spices and salt. Remove the pork chops from the egg/milk mixture and coat thoroughly with the crumb mixture. Place chops in prepared pan and bake for 20 minutes. Turn the chops and bake for another 20 minutes, or until no pink remains. Easy to prepare. My spouse husband enjoyed it more than I did. If I make it again I will lighten up on the paprika and chili powder. I made this recipe with Italian style crumbs, served with mash potatos and corn, it was delicious! I made this recipe tonight for my partner who used to be a chef & he LOVED it, insisting I keep the recipe to make again!! I didn't have cayenne pepper or dry mustard & just used whole egg & skim milk but it was DELICIOUS!! Thank you for the recipe! Average rating of 4.00 stars based on 4 reviews. Summary: A corn crumb crust speckled with herbs and spices create flavor-packed pork chops with a heavenly baked texture.